AVENGERS ROLL CALL: Spider-Man became a reserve member of the Avengers in Avengers #316, 1990 before becoming a full member beginning in New Avengers #1, 2005. He was reduced to probationary status and promptly quit the team during the events of The Superior Spider-Man series in 2013-14. For the history of Spider-Man, check out the post here. After the conclusion of the 1967 Spider-Man series, outside of guest appearances on Spider-Woman Spidey took a decade-long break from starring in animation--and Saturday mornings. Poster for the original American live-action Spidey. In 1974, Spidey made his first leap to live action on the children’s program The Electric Company, portrayed by dancer Danny Seagren. On that show, Spidey’s comics roots were fully embraced through comic pages bookending his sketches and by his speaking through word balloons rather than verbally. In 1977, CBS aired a pilot movie for Spider-Man (initially called The Amazing Spider-Man) starring Nicholas Hammond. 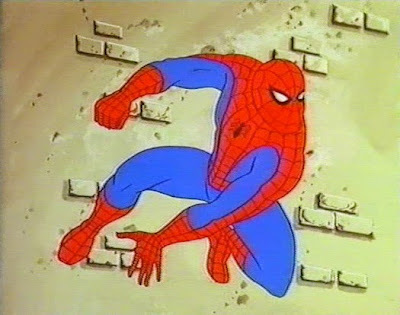 The series ran sporadically for 13 episodes until 1979 and was a radical departure from the source material; featuring a new origin for Spidey that didn’t involve Uncle Ben (named Max through dialogue), limited web-slinging, and none of the classic villains. At the same time, Toei Company produced a 41-episode series in Japan starring Shinji Todo. Spidey in name and costume only, it set the standard for all future Toei productions by giving Spidey a giant robot, Leopardon, which he could call to deal with giant versions of the monsters he fought. Spidey makes his return to his own animated series. In 1981, Friz Freleng left the company he founded, DePatie-Freleng Enterprises, to resume his former job with Warner Bros. Animation. That sparked the sale of the company to Cadence Industries, who also owned Marvel Comics Group. Renamed Marvel Productions, the company decided to use Spidey as their launch program as a way to attract network attention to Marvel’s other properties and potentially bring them to television. The result was the syndicated Spider-Man. The Black Cat plays for keeps. Joining Spidey once again was his stable supporting cast of Daily Bugle publisher J. Jonah Jameson (William Woodson), his editor Robbie Robertson (Buster Jones) and secretary Betty Brant (Mona Marshall). Various classic villains made their return to the small screen including the insane Green Goblin (series producer Dennis Marks), crime boss Kingpin, the mechanical-armed Dr. Octopus (both Stanley Jones) and the mutated Lizard (Corey Burton) as well as some first-timers such as rival crime boss Silvio Silvermane (Paul Winchell) and the thieving Black Cat (Morgan Lofting). Other Marvel Comics characters also appeared on the show, including Captain America (George DiCenzo), Namor the Sub-Mariner (Jerry Dexter), and the X-Men villain Magneto (Michael Rye). Fantastic Four villain Dr. Doom (Ralph James) made several appearances in an ongoing story arc throughout the series’ run. 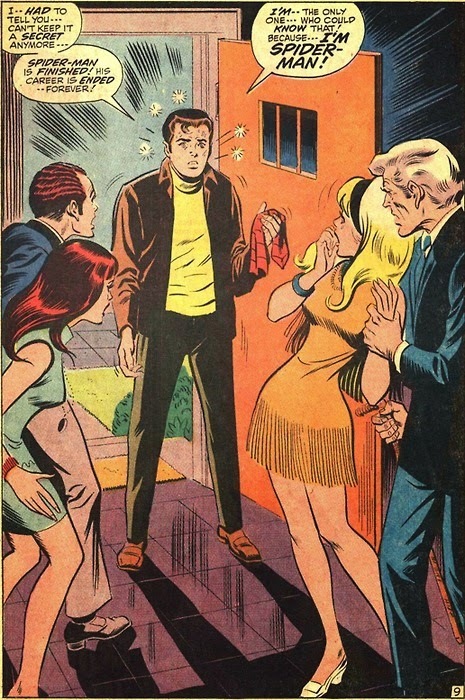 Romita's spider-fashion crosses over into the comics. The character designs by Rick Hoberg took a strong inspiration from comic book artist John Romita, particularly from his work on the newspaper strip at the time (on which Hoberg also worked for a year). Peter Parker’s (Ted Schwartz) look featured the strip’s new hairstyle and usual outfit of slacks and a jacket over a turtleneck (meant to hide the neck of Peter’s costume). It also introduced the concept of Spidey’s mask being attached to the back of the costume’s neck and being pulled on like a hood. The show itself maintained the feel of the comics, focusing on Peter’s balance of his personal life as a photographer for The Daily Bugle and caring for his elderly Aunt May (Linda Gary) with his superhero life. Notably, Spidey’s early-warning spider-sense was represented by his eyes glowing accompanied by a sound effect, rather than the wavy lines over his head in the comics. 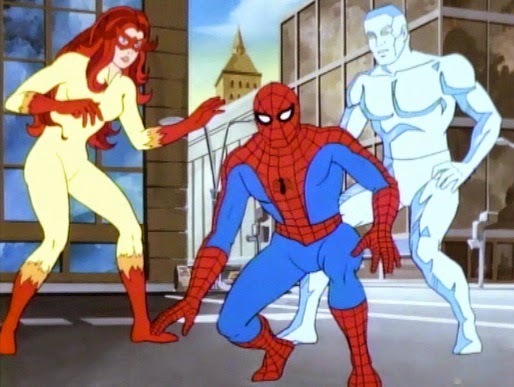 Spider-Man with Firestar and Iceman in Amazing Friends. Unable to secure a network without a sufficient gimmick, halfway through production of the series Marvel Productions began work on a second Spidey series called Spider-Man and his Amazing Friends, which was meant to be Marvel’s attempt at a Super Friends show by having Spidey (Dan Gilvezan) paired up with original X-Man Iceman (Frank Welker) and new character Firestar (Kathy Garver). Because the designs and music composed by Johnny Douglas were the same or similar in both shows, it was often believed that Amazing Friends was a follow-up to the series. The two shows were later retroactively connected through the use of flashbacks in episodes of Amazing Friends. The solo Spidey show was released in syndication in a package that included the previous Spidey series, and ran for a single season. The UK release of the series. The series was rerun as part of Marvel Action Universe; a 1988-91 syndicated programming block that featured various programs by Marvel Productions. Several episodes were released on VHS and Betamax, though the series has yet to be released in the United States on DVD. 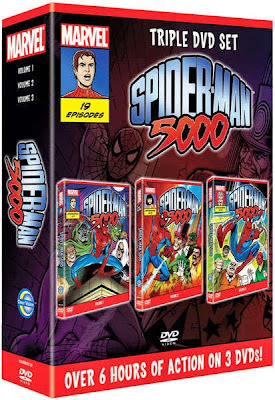 It did receive a complete series release in the United Kingdom under the title Spider-Man 5000 by Clear Vision. In Canada, Morningstar Entertainment released the episode “The Vulture Has Landed” in a set called Spider-Man vs. The Vulture and was paired up with two episodes from the 1967 series. “Canon of Doom” was also released as a bonus feature of the Fantastic Four vs. Doctor Doom set. “Arsenic and Aunt May” was included in the Heroes box set. The Morningstar DVDs were all mastered off of the VHS/Betamax copies released by Prism Video in 1985 from their Marvel Video Library series. Netflix streamed the entire series between 2011 and 2013 before losing the rights. “Bubble, Bubble, Oil and Trouble” (9/12/81) – Dr. Octopus commits various strange crimes in order to upgrade his mechanical arms and steal the world’s oil supply. “Dr. Doom, Master of the World (9/19/81) – Dr. Doom plots to brainwash various world leaders in order to be declared the master of the world at the upcoming United Nations summit. “Lizards, Lizards, Everywhere” (9/26/81) – The Lizard frees all the reptiles in the Central Park Zoo in order to create an army and turn the city into his own personal swampland. “Curiosity Killed the Spider-Man” (10/3/81) – Black Cat uses the Bugle to issue a challenge to Spidey to keep her from stealing the Maltese Mouse. “The Sandman is Coming” (10/10/81) – Sandman steals radioactive soil samples from NASA in order to make himself more powerful. “When Magneto Speaks…People Listen” (10/17/81) – Magneto captures communication satellites and power generators for a million dollars in ransom. “The Pied Piper of New York Town” (10/24/81) – Mysterio uses his new nightclub to hypnotize the patrons into his own private army to use on his thefts. “The Doctor Prescribes Doom” (10/31/81) – Dr. Doom makes another attempt for the world by replacing world leaders with robot duplicates under his control. “Carnival of Crime” (11/7/81) – Ringmaster’s circus comes to town and uses a special gas to rob banks and make people believe Spidey is the thief. “Revenge of the Green Goblin” (11/14/81) – Norman Osborn escapes from the mental institution and remembers he’s the Green Goblin, seeking revenge against Spidey and J. Jonah Jameson. “Triangle of Evil” (11/21/81) – Stuntman pits Spidey against deadly stunts in a ploy to pay off damages to Jonah’s property caused by Spidey trying to stop the Triangle of Evil’s robbery. “The A-B-C’s of D-O-O-M” (11/28/81) – Dr. Doom partners with Goron and uses his powers to enslave world leaders and steal a missile guidance system. “The Sidewinder Strikes!” (12/5/81) – Cowboy villain the Sidewinder robs a convoy of its valuable cargo and hides out in the local rodeo. “The Hunter and the Hunted” (12/12/81) – Jonah hires Kraven the Hunter to capture a sabre-tooth tiger for the Bugle’s mascot, which ends up being the pet of Ka-Zar. “The Incredible Shrinking Spider-Man” (12/19/81) – An ignored genius becomes the Gadgeteer and steals a shrinking device he uses to shrink Spidey. “The Unfathomable Professor Gizmo” (12/26/81) – Professor Gizmo robs a charity cruise in order to draw out Spidey and force him to help Gizmo retrieve a sunken treasure. “Canon of Doom” (1/2/82) – Dr. Doom comes to New York to stop the earthquakes they’ve been having, which were caused by Doom’s laser canon. “The Capture of Captain America” (1/9/82) – Jonah honors Captain America, which Red Skull uses as an opportunity to kidnap Cap, for which Spidey is blamed. “The Doom Report” (1/16/82) – Dr. Doom threatens the UN with a weather device for full control while a Lateverian resistance movement plots against Doom in New York. “The Web of Nephilia” (1/23/82) – Dr. Bradley Shaw obtains blood samples from Spidey and attempts to duplicate his powers, transforming himself into a mutant spider. “Countdown to Doom” (1/30/82) – Dr. Doom’s latest plot involves a device attached to NASA’s rocket, which will move the Earth out of obit and into a new ice age. “Arsenic and Aunt May” (2/6/82) – Chameleon discovers Spidey’s identity and disguises himself as Uncle Ben to give Aunt May a necklace to hypnotize her into killing Spidey. “The Vulture Has Landed” (2/13/82) – The Vulture kidnaps scientists in order to gain control of a NASA space probe and mistakes Peter for one of them. “Wrath of the Sub-Mariner” (2/20/82) – Sub-Mariner wreaks havoc on the surface world in response to ocean pollution coming from Kingpin’s powerful acid. “The Return of the Kingpin” (2/27/82) – Kingpin manages to trick Spidey into committing a series of crimes. “Under the Wizard’s Spell” (3/6/82) – The Wizard forces Medusa to steal an electronic device from a military base.